The clubhouse will be open during the Karneval, Rollo is planning to roast a pig and have the doors open for everyone interested. There will be refreshments for the thirsty, food for the hungry and hopefully some activities for the playful. Doors open at 9am both friday and saturday. contact rollo if you have any good ideas or want to help out. 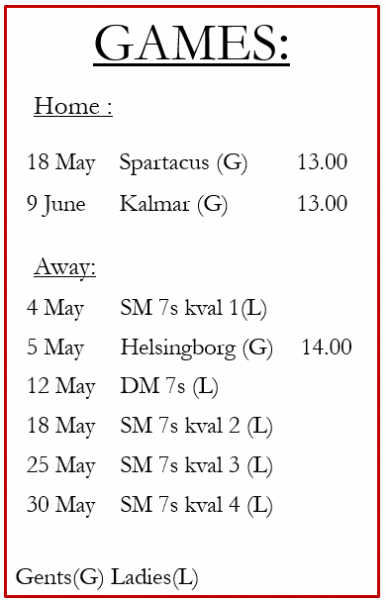 On saturday at 13.00 the ladies are playing Gothenburg. They are last years swedish champions and have half of the national side in their team, so it will be a very tough and fun game. Anyone who are not watching karnevalståget are welcome to cheer us on. This entry was posted in Festivities on May 19, 2010 by admin. This saturday Lugi ladies played against Malmö/pingvin and the men went up against Malmö who are playing the series again. The ladies played with 13 players of varying experience, for some it was the first game and for some it was the first game in years. We would like to thank everyone for coming out to make it a great game, our farmers from Helsingborg and Växjö, who already feel like part of the team, our golden oldies, our newbies with so much promise and those who made a strong effort although they would probably not have been able to drive. PMS put up a great game and the score finished at 7-67. LUGIS point where scored by Kerstin Lövendahl and Amanda Sandsborg. PMS gave us a good look on what we need to improve for the next game against Gothenburg, so lets work together these three weeks to find eachother and get the teamplay going. Player of the game was Caroline Lindberg for her adrenaline and aggressive tackling and Ilse Huisman that was everywhere on the field and keept up a positive atmosphere in the team the entire game. Sad to say these two did not hold the LUGI colors high when it came to the down-down-down part and again we lost to the PMS girls who really enjoy their spirits. Lugi men had a strong squad of very fast, very skilled players with great balls being played out to the backline. Malmö had the weight and a strong forwards play kept offloading towards the white line. It was a lot of energy in this Derby game and the outcome was 12-47 with a win for Malmö when the whistle blew. It was a good day of Rugby, well-dressed Malmö players and hulahula girls spiced up the third half. The ladies are already brainstorming for third half outfits when we play PMS next time. This entry was posted in Match Report, Women's Team on May 3, 2010 by admin.